In the end, the fire-breathing dragon could not be denied. Vietnam’s Dragon Bridge, owned by the Da Nang Department of Transportation, and designed by Louis Berger and Ammann & Whitney, was named the recipient of the 2016 ASCE Outstanding Civil Engineering Achievement Award during the annual Outstanding Projects And Leaders Gala, March 17, in Arlington, VA. 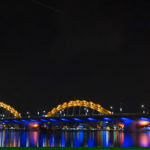 The bridge links the city of Da Nang across the Han River to the country’s developing eastern shores, nearby beach resorts, and a route to the town of Hoi An. 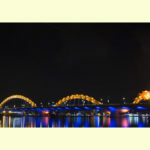 And its dragon-shaped design has made the bridge an instant tourist attraction and symbol of the city. 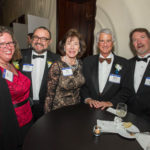 ASCE’s annual OCEA Award honors projects that best illustrates superior civil engineering skills and represents a significant contribution to civil engineering progress and society. Honoring an overall project rather than an individual, the award celebrates the contributions of many engineers. 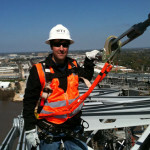 View videos about the Dragon Bridge and the five other OCEA finalists. Rather than the traditional twin arch supports running alongside the bridge deck, the Dragon Bridge features a single arch support down the centerline, giving the effect of a dragon rising from the deck. The arch, or dragon, structure is five tubular steel sections integral to the piers. 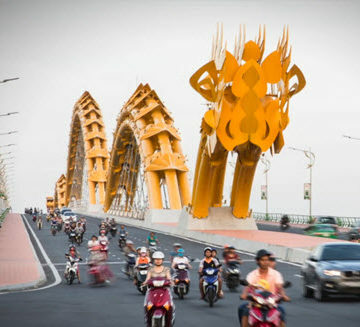 The Da Nang People’s Committee originally sponsored an international design competition for what would become the Dragon Bridge. As the project developed, the engineers in Vietnam suggested one more, extra tweak. “They wanted the dragon to breathe fire and spit water,” Ivanoff said, chuckling. “I was rather dubious about that. Imagine you’re driving across the river and all of the sudden the bridge is shooting out a fireball. The city closes the bridge to traffic on weekend evenings. The 15,000 LED lights bathe the bridge in greens, blues and purples, and the arch – or the head of the dragon – spouts fire and water. “It’s really, really quite spectacular,” Ivanoff said. And now the bridge takes its place among the storied history of OCEA-honored projects. As a psychic what would rock is a roller coaster dragon! Just to think 45 years ago I was in an American armored cavalry unit patrolling around the city of Da Nang involved in various firefights. What a wonderful transition to peace and prosperity and the fact that an American company was involved in the design and construction of this amazing bridge.